Is THAT what that crunchy filling is?!? A TOY?!? 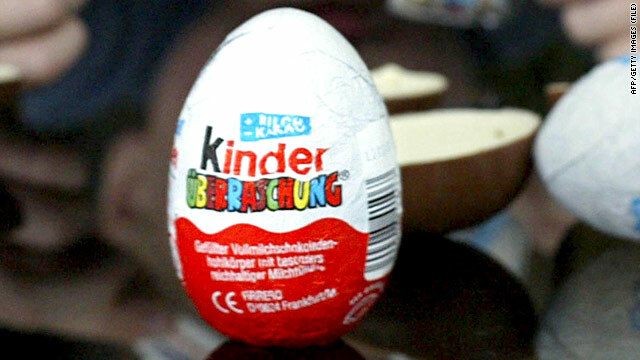 You can buy known killers like guns and cigarettes, but you can't buy a Kinder Egg....ridiculous. Yes, please ban everything dangerous. Everyone into your Party coveralls and line up for your bowl of Victory Porridge. They aren't for CHILDREN. I guess all consumer protections should just go away because you can buy a gun or a cigarette? Do you then give these to kids? Not all protections should go away. Just the exceedingly stupid ones. Like the bans on Kinder eggs. For those who think Obama just did this: The United States Federal Food, Drug, and Cosmetic Act (abbreviated as FFDCA, FDCA, or FD&C), is a set of laws passed by Congress in 1938 giving authority to the U.S. Food and Drug Administration (FDA) to oversee the safety of food, drugs, and cosmetics. The introduction of this act was influenced by the death of more than 100 patients due to a sulfanilamide medication where diethylene glycol was used to dissolve the drug and make a liquid form. See Elixir Sulfanilamide disaster. So you can't get a German egg with a toy that could choke your toddler. Go buy a chocolate rabbit make in the USA and shut up. Choke my toddler – oh my! Call out the legions of large women in muu-muu's with social science degrees and Government positions to save my children from their parents! Don't take away my chocolate LIBERTY! Call out the legions of uneducated blue collar workers to sit in D.C. in lawnchairs and protect my liberty! Ridiculous. Let's bring all the illegals we want over the border, but dang it, no chocolate eggs with a toy inside. Actually, I am. Good of you to notice. You aren't, that's obvious. Thanks for making my night! Spent 3 years in Germany. My kids LOVED these. They were very little. And they survived the experience. This is what you get from a nation whose schools instead of graduating engineers produce masses of lawyers and public administrators looking to make a buck off nothing or to justify their existences by passing more stupid laws. So you can't get a German egg with a toy that could choke your toddler. Go buy a chocolate rabbit made in the USA and shut up. They have been recalled/banned since 1997. You know how long ago that was right? Is there any chocolate made in the US any more? Growing up in Germany, these eggs were a staple of my childhood. I'd rather not have to wait until my parents make trips outside the country to get my hands on these. Besides – isn't there something more important you should be securing at the border, Customs? This is possibly the most ridiculous thing I've ever seen. I grew up with these when my German grandmother put them in our stockings for Christmas. It's amazing we didn't choke to death . How about letting people grow up the way we used to – without the help of the government then maybe we wouldn't be breeding such stupidity as we are these days. Talk about hitting the nail on the head...! Good job! But a large part of the problem is lawyers and Tort law suits in particular. No one is responsible for their actions anymore, and lawyers will sue over a broken toenail, and there are idiot juries that make monetary awards in the most ridiculous lawsuits you've ever heard of. That and the government (no so slowly) chipping away at our freedoms is really doing us all in. WOW! Whose bright idea was this anyways? I'd like to challenge them to a Kinder Egg toy building duel for our right to regain this delectable treat. Big fluffy tail... tiny little dog. Maybe we need tort reform so this ridiculous nonsense doesn't offer a profit for lawyers. 1. To fix firmly in a surrounding mass: embed a post in concrete; fossils embedded in shale. 2. To enclose snugly or firmly. 3. To cause to be an integral part of a surrounding whole: "a minor accuracy embedded in a larger untruth" (Ian Jack). 4. To assign (a journalist) to travel with a military unit during an armed conflict. News Flash CNN "News" the toy is NOT 'embedded' in the food item, it is inside another plastic egg inside the hollow cavity of chocolate, shake one for yourselves . And yes, well, we all know the border are experts at cavity searches. And speaking of "non-nutritive", I drive one block and there are 6 fast food places that sell "non-nutritive" crap that is totally legal and promoted shamelessly and that's okay? Stupid story (though its a fact, the border does confiscate them) so I will go eat my Kinder Surprise all to myself and not share with you. Its actually REALLY, REALLY good chocolate, but you'll never know. I used to eat those eggs when i was little. I mean the toy is fricken huge, only a fat obese boy could choke on that thing. The toy DONT look NOWERE like chocolate. They should JUST ban cherry's because they have seeds that little kids can choke on. ".....ban cherry's because they have seeds that little kids can choke on."